America has been a land of opportunity for countless immigrants, among them John Brophy, who was born in Ireland in 1841, arrived in Ridgefield in 1850 at the age of nine, and by the turn of the 20th Century had become one of the town’s leading citizens who counted three U.S. presidents — Arthur, Grant and Garfield — among his acquaintances. His journey to America with his parents and his two sisters took seven weeks, including traveling to Liverpool, England, to board a transAtlantic ship. The family at first lived on the north side of the village, and Brophy’s first job was as a child after grammar school classes, grinding bark for hide tanning at Jabez Mix Gilbert’s tannery at Titicus. The family moved to West Lane (the Brophy house still stands down the hill a bit just beyond and opposite the West Lane schoolhouse). As a teenager, Brophy drove a food market wagon, worked at the candlestick factory on Main Street, and later had a job at the Glenburg Mills and Chemical Works in Georgetown. He went to work for Ridgefielder Henry Smith, who supplied blankets and linens for Pullman cars used throughout the eastern United States. That job required some traveling, during which Brophy came across new possibilities for employment. He soon became a U.S. customs inspector at the Port of New York, a job in which he dealt with many influential people. 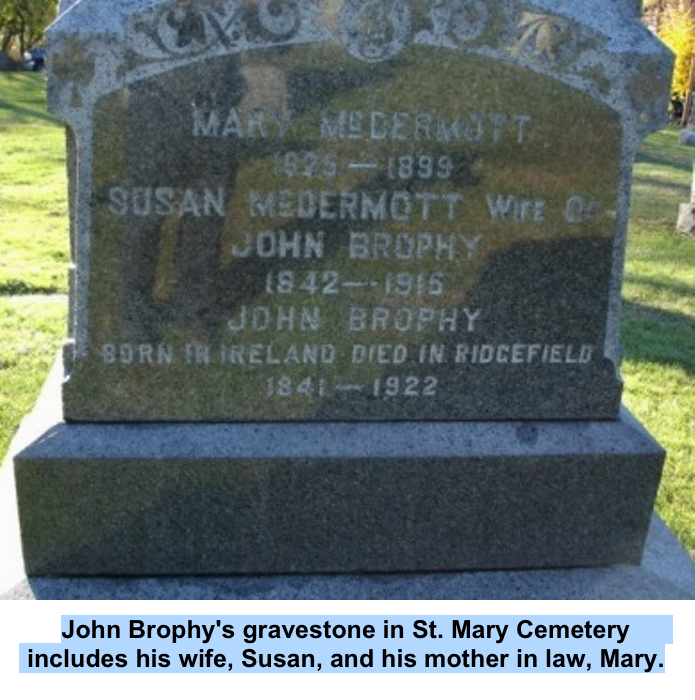 While living in New York, he met Susan McDermott and the two were married in 1870 in St. Patrick’s Cathedral. In 1903, the Republican was elected a Ridgefield representative to the state legislature and then became a Fairfield County commissioner for 12 years in the days when Connecticut still had county government. Meanwhile, he was also serving as a director or board member of both the Ridgefield Savings Bank and the First National Bank of Ridgefield, and was a charter member and first chancellor of the Knights of Columbus here. Brophy maintained that he knew Horace Greeley well, and was friends with many leading political figures of the age, including the three presidents, as well as Lincoln’s Secretary of State William Seward and Vice President Schuyler Colfax. He was also proud of noting that he had met Abraham Lincoln, as well as Susan B. Anthony and Elizabeth Cady Stanton, the suffragists. In his 80s, Brophy had a pet parrot that could "whistle, sing and had a vocabulary of 100 words," The Press reported. He died in 1922 at the age of 81.